Home stagers have a particularly tricky job – not only do they need to make a dwelling that is appealing to a large group of individuals, they also need to do it without infusing too much of the homeowners' specific aesthetics, while still ensuring the abode is welcoming and personable. Experts Markham Stagers are an example of how to do things right. 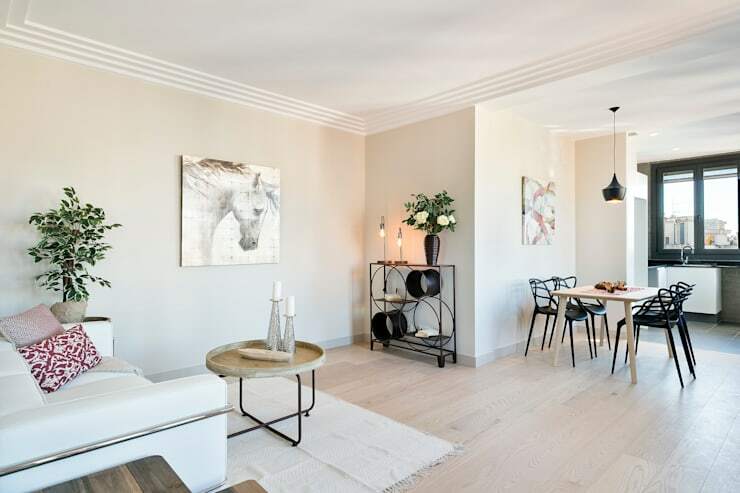 We’ll be checking out one of their finest properties, which is bursting with light-filled rooms, elegant living spaces and a true sense of homely comfort. 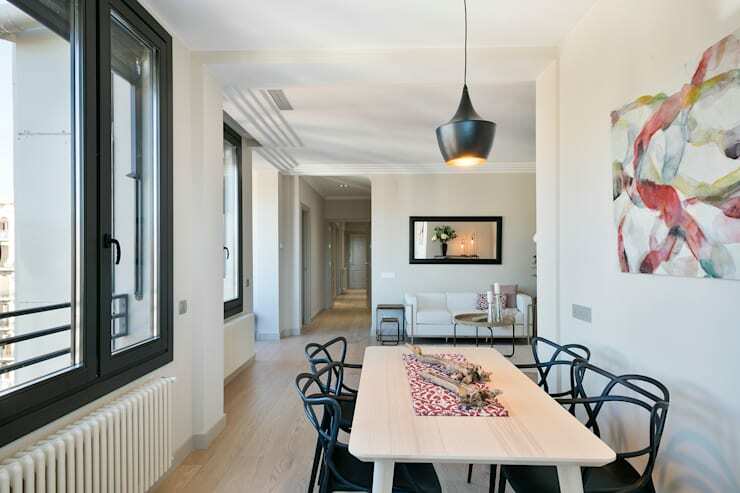 Located in Barcelona, this bright, 95 square metre apartment boasts long corridors, large rooms and a neutral colour scheme throughout. If you’d like to see what other surprises this home has in store, read on below and find out! As we first enter the home, we're immediately filled with a sense of allure and charm. 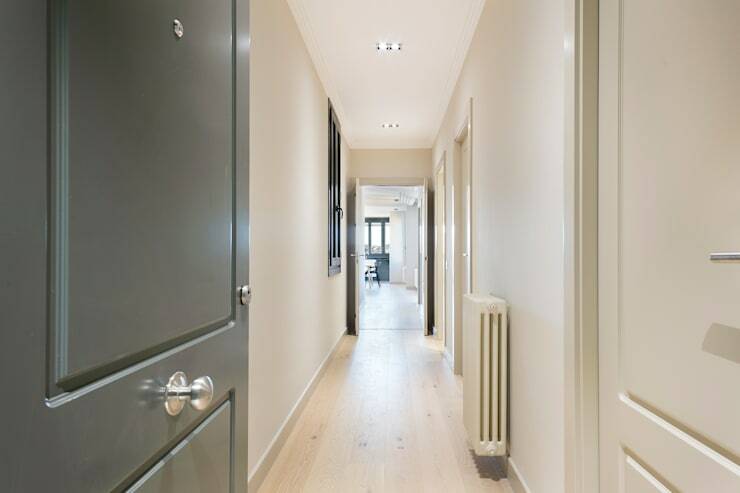 The entry is truly delightful, and is everything one might expect from a stylishly renovated, yet timeless abode. Neutral tones prevail, and are contrasted beautifully by the dark grey front door, which alludes to a lovely dwelling within. Totally modernised and perfect for a couple or family, this apartment ticks all the boxes. 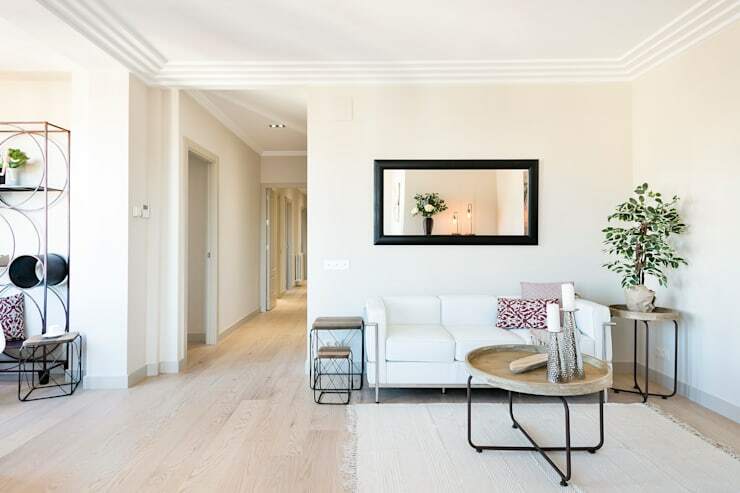 We particularly love the light timber flooring, which although laminate, offers a whitewashed aesthetic, and softens the contemporary ambience. Moving immediately to the main living space we see the open plan layout, with plenty of space for everyone. A hint of bucolic beauty abounds within this main room, with the whitewashed flooring coordinating wonderfully against the modern yet age-defiant furniture. At the end of the room we see the compact kitchen, which is set just below one of the many windows that bring in a huge volume of natural light. The combination of eras and accessories is what makes this home special and inviting. Overall the range of furniture is simple and timeless, which ensures it is appealing to large groups of people. As home stagers need to consider their interior will be viewed by different tastes and preferences, keeping a light and neutral theme such as this is a smart move. Indoor plants have also been added, ensuring the room remains fresh, providing contrast to the other muted accessories and accoutrements. Although the colour scheme is mainly white and cream, certain black contrasts have been added. The mirror frame reflects the window frames, while the dining chairs and suspended light also impart difference and interest within the room. This contrast ensures the design doesn't feel boring or repetitive, and instead adds drama, vivacity and edginess to the interior. The corner nook that is situated just off of the living room is wonderfully setup as a quiet reading space. 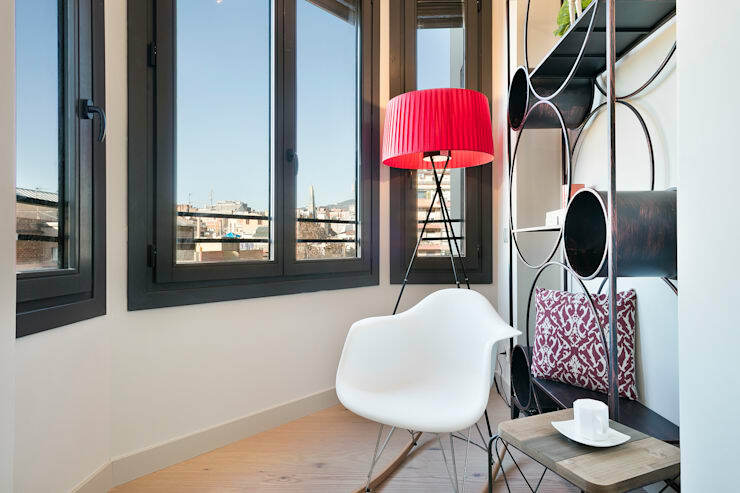 Here an Eames rocking chair sits adjacent a freestanding lamp, with an eye-catching shelf that could house books and other accessories. The designers have definitely made the most of this floor plan. Each space within the room is elegantly adorned with just the right amount of furniture and ornamentation. At no point does the room feel overwhelming or uninviting; it is simple, chic and warm. Contrast has been employed beautifully, and we see that the layout itself reflects a sense of openness. 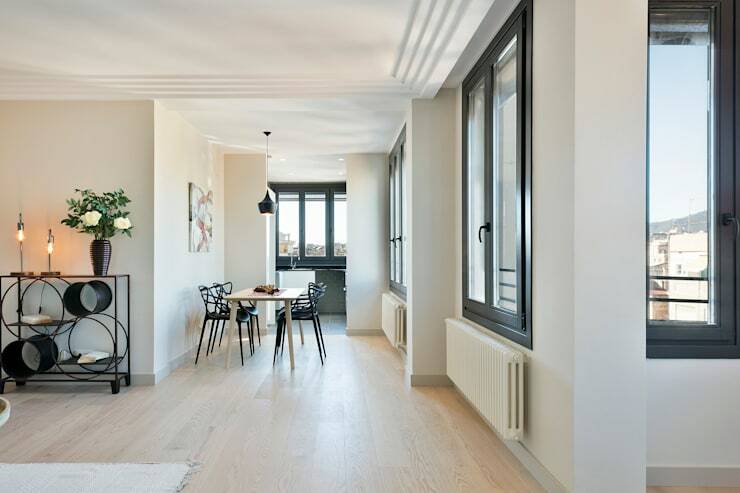 Movement and cohesion are easily noted within this unified floor plan, with every inch working in a way that provides liveability and versatility. What did you think? Would you like to live here?